It used to be that the places on our planet least populated by man and industry could be tapped for cleaner water. Yet, now contaminants like pharmaceuticals, lead, mercury, parasites, and pesticides can make their way into many water sources. So where can a family go for cleaner, fresher water? How about your own kitchen! EveryDrop Filters by Whirlpool Water introduces our advanced ice and water refrigerator filters. EveryDrop Filters is certified to reduce more contaminants - with new Triple Filtration Technology. Filter 8 reduces 4 types of contaminants; so enriching everyone's well-being with cleaner water, right from your refrigerator, is easy. Remember to replace your water filter every 6 months to maximize contaminant reduction. 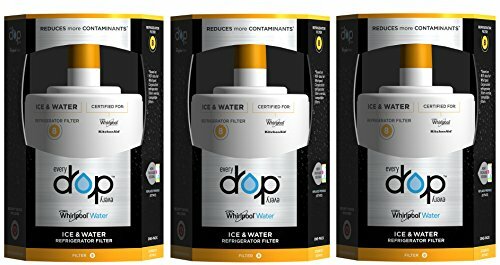 EveryDrop Filter 8 is the only filter Certified by Whirlpool Corporation to work with your Whirlpool, Maytag, KitchenAid, JennAir, and Amana refrigerator.